DeShields has the big league bloodlines of his namesake father who played in the Majors for 13 seasons, and was traded for Pedro Martinez straight up back in 1993. As a kid, DeShields roamed Major League clubhouses. Matt Stairs was his hero. Mark McGwire, Sammy Sosa, and Cal Ripken Jr. were good to him. Albert Belle? Incredibly polite. “It was pretty cool being around them, knowing they can be future Hall of Famers,” Delino said. Back in 2005, Baseball America had Delino rated as the top 12-year-old baseball prospect. Delino needs to stay motivated and work at the game with a greater level of energy. Deshields Jr. has everyday starter potential if he comes close to tapping into his potential. Some scouts are highly skeptical he ever will, as they have been turned off by his consistent lack of effort. DeShields Jr., who committed to LSU to play baseball, was the leadoff hitter for his private school, Woodward Academy in College Park, Georgia, and hit .415 and led the team in homers (nine), RBIs (40) and stolen bases (29). He was also a running back, on the football team, but quit after his junior year because of his standing in the MLB draft. January 16, 2011: DeShields was arrested and charged with driving under the influence. He was booked at 1:06 a.m. by the Athens-Clarke Police department, then released two hours later on $2,500 bond. Delino also was charged with underage possession of alcohol and a traffic violation (driving the wrong way on a one-way street). According to a police report, he was leaving a gathering at a University of Georgia fraternity. In 2011, the Baseball America Prospect Handbook rated Delino as the 2nd-best prospect in the Houston farm system. He was at #8 in the spring of 2012, then at #6 in the offseason before 2013 spring camps opened. He was at #13 in the spring of 2014. He was rated at # 24 in the Rangers organization in the spring of 2015. In 2012, DeShields was named the Astros Minor League Player of the Year after he hit a combined .287 (154-for-537) with a .389 on-base percentage, 12 homers, 61 RBIs and 101 stolen bases for Class A Lexington (111 games) and Class A Advanced Lancaster (24 games). He's the first player in the history of the Astros organization to swipe at least 100 bases in a season. Delino learned to play harder and smarter in 2012. DeShields spends his free time learning how to play guitar. Delino is polite and thoughtful. Delino was glued to the television watching his younger sister, Diamond, score 38 points for the University of North Carolina in a win over North Carolina State in February 2014. It was the most points a freshman has scored in team history. Diamond DeShields, a versatile 6-foot-1 player, scored 30 points in a win over Duke a week earlier. "Any time she plays on TV or whatever, I'm always tuned in," Delino said. "In big games, she turns it up a little bit." DeShields' father, Delino, was set to play basketball at Villanova before he wound up getting drafted by the Montreal Expos in the first round of the 1987 Draft and played 13 years in the Major Leagues, so sports run deep in the family. Spring 2015: The Rangers officially informed outfielder Delino DeShields that he made the team. DeShields, a Rule 5 Draft pick, will be used off the bench as an outfielder, pinch-runner and possibly on occasion at second base. Delino managed to keep busy shagging fly-balls, taking grounders at second base, his old position, and tracking pitches during bullpen sessions before games. He also takes extra batting practice when offered. The Rangers applaud DeShields for asking questions, watching games closely from the bench, and trying to learn pitchers’ pickoff moves—an important skill given that much of his game action will come as a pinch-runner. And he has no complaints about anything. 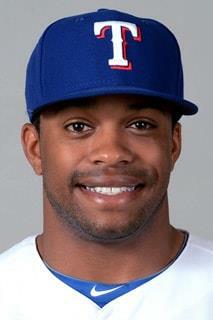 April 9, 2015: One day shy of the 25th anniversary of his father's MLB debut, Rangers rookie Delino DeShields Jr. legged out an infield single to record his first MLB hit in a loss to the A's. In 2015, Deshields was selected as the Rangers Rookie of the Year in voting by the local chapter of the Baseball Writers' Association of America. Delino's mother ran track and field at the University of Tennessee. Delino's stepmom has her own TV show on TBS called "Georgia Traveler"
May 13, 2017: Delino's father was not at his son's first Opening Day with the Rangers in 2015, or his Major League debut later that week. Dad, a former Major League second baseman, was tending to his day job as the manager of the Reds' Triple-A team in Louisville. Tisha DeShields was there though, as she has always been there for Delino while his dad pursued his Major League career. "It was just like it used to be," DeShields said. "My mom is not very vocal, but you can always tell when she is there. Even growing up, she never sat in the stands. She had bad anxiety so she would go into the outfield and watch from afar. "But I always knew she was there. Honestly, it would be weird if I could see her while I was playing. As long as I know she is there, it makes me comfortable." DeShields is well-known for being the son of a Major League infielder, and they have a strong relationship. But the relationship with his mother is especially special. "My mom has been my rock since I was little," DeShields said. "I was born into baseball so ever since then, my dad hasn't always been around so my mom has always been like super woman to me. She always made sure I was on time with everything. She in a sense taught me how to be a man. My dad helped too, but the majority of my time was spent with her. "I learned how to tie a tie and open doors for women and be a gentleman. She instilled those things in me. I'm still learning from her. She is very wise ... beyond her age. She had four kids and managed them all while my dad was gone. It was pretty incredible." DeShields has two younger sisters, Diamond and Denim, and a younger brother, D'Angelo. Diamond was a star basketball player at the University of Tennessee and mom spent Mother's Day weekend in Knoxville watching her daughter graduate. Sports were always big in the DeShields family. Delino was born in 1992 when his father was in his third season with the Montreal Expos. His father played through 2002, so it was Tisha who shepherded the children through all their activities in suburban Atlanta. "We only went to see him a couple of times -- spring break, sometimes during the summer," DeShields said. "But we were always playing sports, so I was playing tournaments on the weekend and my sister was playing AAU basketball. I'm sure it was difficult for her, us being kids. We were just not trying to give her that hard of a time. She did a good job, almost being a single parent during those years. "We had this RV and we used to travel in it. If I played in Tennessee, North Carolina or Alabama, whatever ... she would pack up all the kids and we would take little road trips. Those were probably the best memories. She did all the driving. We would leave late at night and she would drive all night while we slept. She always tried to make it as easy for us as possible growing up." That's why there was no doubt Tisha would be there when her son took the field for the Rangers in 2015. "She kind of took me on this road, to my Little League games, taking me across the country to watch me play," DeShields said. Dec 21, 2018: Rangers outfielder Delino DeShields' father was a Major League infielder for 13 seasons whose list of accomplishments includes 463 stolen bases. His mother was an All-American track and field athlete at the University of Tennessee who qualified for the 1992 Olympics. Even his sister Diamond was a star basketball player at Tennessee who has played professionally in Turkey. But according to DeShields, that's not why he is one of the fastest players in the Major Leagues. DeShields said his speed came from Buddy, his first personal trainer. Buddy is also the best Christmas present DeShields ever received while growing up in the Atlanta area. "He was a black lab," DeShields said. "He was my first dog. I might have been nine. We always had the gifts and all of that stuff at Christmas, but that dog was everything to me. Probably the fondest memory I can remember." Just to understand what Buddy meant to him, consider the name. Buddy was named after a grandfather that DeShields never knew. "I named him after my grandfather who passed away," DeShields said. "I never knew him. He passed away when my mom was young. Buddy is not with us anymore, but that was pretty neat for me, to have my first dog named after my grandfather." Doesn't every boy want a dog for Christmas? "I always wanted a dog growing up," DeShields said. "We lived on three acres of property. It was fun for me to go outside and play. I would take my tennis ball and throw it and chase it with Buddy. That's where I got my speed from. Yeah, he was my first personal trainer. "I do have a soft spot for dogs. I have a dog now; I've always had dogs. I don't know if it is a comfort thing, but they have always been good for me. I've been lucky to have well-behaved dogs. As long as I have well-behaved dogs, I'm good." "It will be great to have all the family there together," DeShields said. "We are all so busy, the holidays are about the only time we can be together. It will be great." DeShields currently has an American bulldog, Blu, so he won't need another pet as a Christmas gift. But there is something he wants to find under his tree this year. He wants to be the Rangers' starting center fielder again. There aren’t many memorable moments in Spring Training but the DeShields family experienced one on March 19th, 2019 when the Rangers hosted the Reds at Surprise Stadium. Outfielder Delino DeShields took the lineup card out for the Rangers and Delino DeShields did so, too, as the Reds' first-base coach. They are not Senior and Junior (different middle names) but they are father and son, and this was the first time they have been on the same Major League field together. June 2010: The Astros made Deshields their #1 pick in the draft, the 8th pick overall, out of Woodward Academy in College Park, Georgia. They signed Delino on August 4 for a bonus of $2.1 million. Lincoln Martin is the scout who signed DeShields. December 21, 2014: The Rangers chose DeShields in the Rule 5 Draft, out of the Astros organization. Texas gave Delino a shot during 2015 spring training to be the backup to center fielder Leonys Martin. Jan 11, 2019: Delino and the Rangers avoided arbitration agreeing to a one-year deal worth $1.4 million. DeShields is a line-drive hitter for a good average and a little bit of home run power. His game is more speed. But his bat speed helps him catch up to the best of fastballs. "What I really rely on is getting on base and changing the game on the basepaths, but every now and then I can poke a ball over the fence," DeShields said. "You can't go wrong with hitting a couple dingers." His swing is relatively low-maintenance and compact. Delino tends to get pull-happy and swing for the fences too frequently instead of using the whole field and taking advantage of his speed with a small-ball approach that would require improved bunting skills. Delino has the stuff to be a leadoff hitter in the majors. He has displayed on-base skills throughout his career. He will have to improve his ability to identify pitches and not strike out so much. But he shows a solid feel for hitting. DeShields has some gap power. His overall plate discipline has improved. His bat heated up starting in 2012, when he stopped falling into trying to pull too many pitches. He now uses the whole field. During the 2014 season Delino missed three weeks after suffering a facial fracture when he took a 90 mph fastball to the face in April. He became an Internet sensation when he Tweeted a photo of his severely swollen face. Rather than return skittish, though, DeShields hit two homers in his first game back and went 7-for-16 over a four-game stretch. He’s a hard-nosed player who, when at his best, can impact a game with above-average speed and surprising power. As of the start of the 2019 season, Delino's career Major League stats were: .244 batting average, 14 home runs with 94 RBI in 1,317 at-bats. Delino has the speed for covering a lot of ground in center field. DeShields had a below-average arm. But, he shortened up his long arm stroke and is now nearly-average with his arm, though his throws can lack accuracy at times. He has fairly good hands at second base. He improved his footwork and double-play pivot, but too many errors and an inability to get real comfortable at the position sent DeShields back to his high school position of center field for 2014. Delino often lobbied high Class A Lancaster manager Rodney Linares to put him in the outfield in 2013. The speedster is finally getting his wish in the Arizona Fall League. In center field, he has things to improve, especially getting a good first step. "His routes are getting batter and his setup is better," said Astros manager Bo Porter, who was in Arizona in November 2013. "That's one of the things we've been stressing to him—if you make the transition, it's about the first step. In the spring of 2015, he was still improving his reads, but looks real good out there. Delino has a goal as a center fielder. "I want to be an elite defender," DeShields said. "I really want to be a good defender for myself and my team. As for Gold Gloves, material things don't matter. I just want to win for the team." The question then would be exactly what constitutes an elite defender in center field. "An elite defender for me is attentive on defense and shows up on every pitch," Rangers manager Jeff Banister said. "He is moving and reading on every pitch. He is the commander in chief of the outfield. He also plays shallow enough that he takes away what happens most [frequently] and still has the proper technique to get the balls in the gaps and over his head." There are more balls hit into shallow center than deep. That's why the elite defenders play as shallow as possible, without worrying about a ball getting over their heads. Andruw Jones played extremely shallow and won 10 Gold Gloves as a center fielder. "Andruw Jones seemed like he was playing 30 feet behind second base and nothing got behind him unless it was over the fence," Banister said. "He had the sheer ability to turn and burn, then glide and catch it. If Delino can add that ..."
DeShields has the speed. He needs to work on his jumps and taking direct routes to the ball. As an inexperienced center fielder, he played deeper than normal last season. The Rangers have made a conscious effort to play shallower this spring. His speed should allow that. According to Statcast, DeShields' average top speed chasing fly balls was 19.36 mph. That was second in the Major Leagues behind Billy Hamilton of the Reds at 19.51. DeShields was ninth in average route efficiency, according to Statcast. Rangers manager Jeff Banister won't yet label Delino as an elite defender, but he said he believes the outfielder is heading down that path. "I think there are elite moments in his game," Banister said. "Elite defenders do it for long periods. He's moving in that direction." Banister said DeShields has had to make major strides in his defense over the past two years to even be considered an elite defensive outfielder, especially since he came up as a second baseman. "That's the beauty of what we do," Banister said. "We ask guys to change positions. Nobody really sees the mistakes, the inabilities, or the nuances. The speed of the game here exposes all the things that you have to work on. To make a change at this level is tough. This was still a young player." Delino causes the opposition headaches with his excellent speed. He is a base stealer extrordinaire. He is graded as a 75-80 runner on the 20-80 scouting scale. He has plus-plus speed, a quick first step, and the ability to read pitchers. "It's just paying attention, being in the dugout picking up stuff from the pitchers and maybe peeking in and looking to see signs and trying to get a good read on everything," DeShields said. DeShields has the explosive speed of his father, who stole 463 bases in his Major League career. Delino is an aggressive base-stealer and is still learning to read a pitcher's moves. When he gets on base, expect him to steal. It's rare for teams to get a lot out of a player picked in the annual Rule 5 Draft. So when the Rangers snatched DeShields from the Astros before the 2015 season, there wasn't much reason for high expectations. May 7, 2018: In a Rangers' win over the Tigers, 7-6, fans witnessed something rather wonderful, compliments of Delino. In the bottom of the seventh, Shin-Soo Choo hit a hard ground ball to second baseman Dixon Machado, who couldn't make the play. This resulted in DeShields scoring ... from first base. He put the wheels on full blast. This was the same inning he beat out a throw to first on a Jose Iglesias bobbled ball. "I never check up at third base," DeShields told MLB.com's T.R. Sullivan. "I always take a hard turn no matter what happens. I got around second base and I was waiting for [third-base coach Tony Beasley] to give me 'go or no.' He gave me a go. It's nice that someone believes in me and trusts me in what I can do and take a chance." He also added he loves to score. "I just love touching home plate," he added. "That's the most important thing. The more I touch home plate, the better chance we have of winning." May 5-12, 2013: DeShields was on the D.L. with a hand injury that nagged him most of the year and cost him power that season. April 18-May 8, 2014: DeShields was out for three weeks after suffering a broken cheekbone when he was hit in the face by a 90-mph fastball in a Double-A Corpus Christi game in Frisco, Texas. Frisco's Phil Klein hit him with a pitch, but Delino left the field under his own power. June 15-July 5, 2015: Delino was on the D.L. with a strained left hamstring. March 30-April 22, 2018: Delino was on the DL with fractured hamate bone in left hand and is expected to be sidelined four-to-six weeks. April 2, 2018: DeShields underwent surgery to repair a broken hamate bone in his left hand. Dr. Thomas DiLiberti, who performed the surgery, said all went well. Aug 4-12, 2018: Delino was on the DL with concussion. Aug 17-Sept 1, 2018: Delino was on the DL with right middle finger fracture. March 3, 2019: Center fielder Delino DeShields was out of action for the second straight day as the Rangers played a pair of split-squad games against the Dodgers and Padres, but manager Chris Woodward said he is acting out of an abundance of caution. “His biggest value and his biggest asset are his legs,” Woodward said. “He’s one of the most impactful guys when he gets on base.” He's been dealing with a sore right knee since colliding with the center-field wall during the first game of the exhibition season.